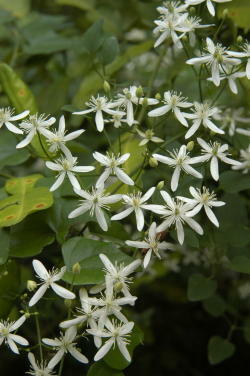 HABIT: Vigorous semi-evergreen high climbing vine with profusion of fragrant 1¡å white flowers in the late summer. CULTURE: Easy to grow in any well-drained soil. Low to moderate water and light fertilizer needs. Do not prune the first year. USES: Climbing vine for fences, arbors, and decorative screens. Late summer flower color. NOTES: Correct botanical name is C. maximowicziana. Also called sweet autumn clematis. Native to Japan. C. x jackmanii also does pretty well here in filtered light. Scarlet clematis (C. texensis) is native and has small unusual red flowers.